Little pom pom’s seem to be showing up in a lot of diy crafts. I have them floating around my house is various nooks and crannies, so I decided to making pom pom wrapping paper. My inspiration came from an image on Wal-mart.com. They used a marker to create garland with poms as the light bulbs, but my affinity towards twine won out – especially with my lack of drawing skills. What can be better than twine and kraft paper? My intention to use the twine as garland went to the way-side. I just couldn’t help myself when I got a hold of the glue-gun and started attaching poms all over. I added jingle bells and some larger poms to give some added dimension and a little sound. This is a gift for my 4 year old grandson who will love the bright colors and the cool remote control snake inside! Hisssssssss…..
HGTV was the basis for my inspiration for big poms made of yarn. Check out the variety of colorful poms and an option using a doily and a smaller pom from HGTV. 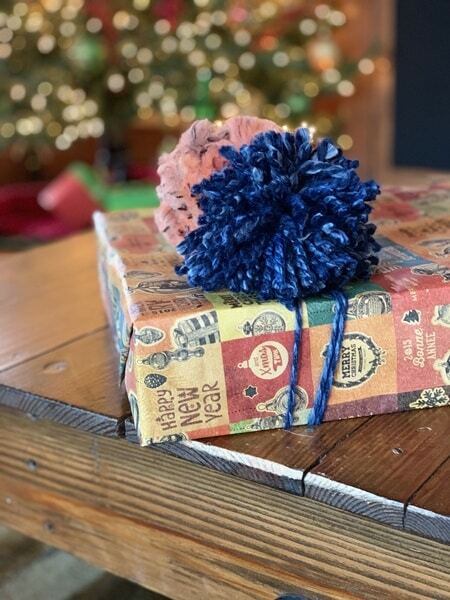 Making the yarn pom is a quick and easy way to add some pop to a present. Here are some step by step instructions. 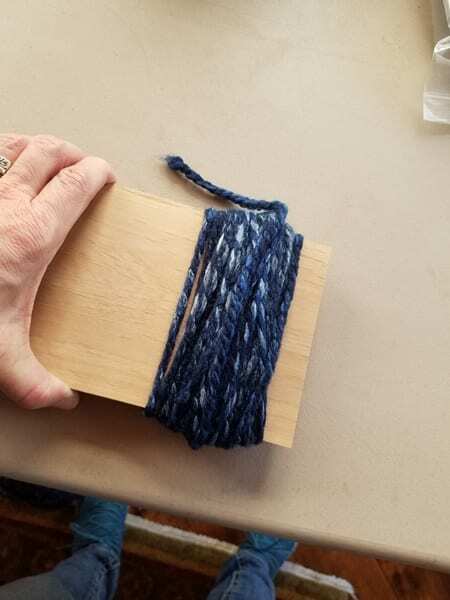 Step 1: Wrap the yarn around a 4″ board. 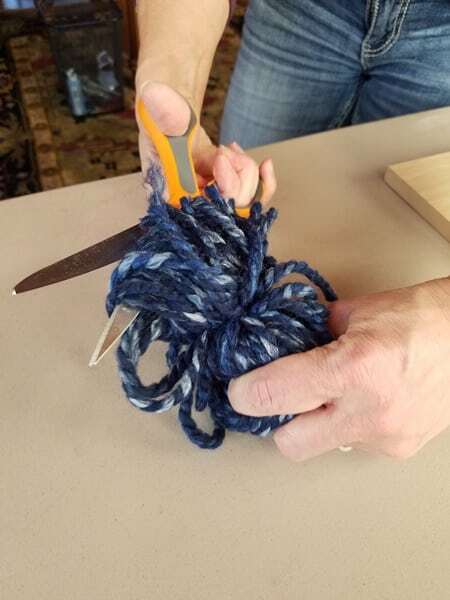 The amount of yarn you use will determine how full the pom will be, so make sure you wrap more than a couple of times. 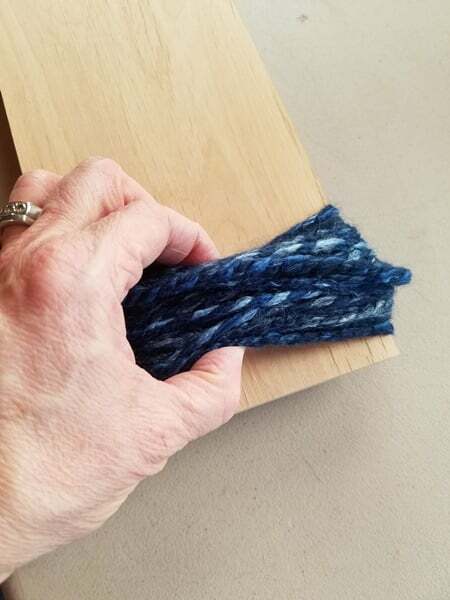 Step 2: Slide the yarn to the edge of the board, and pull it off. Try to use both hands as you pull it off, to retain the loop you created by wrapping it around the board. Step 3: (Some instructions skip this step, but I like to do this extra step to hold the yarn together so no loops slip out as I’m working with it.) 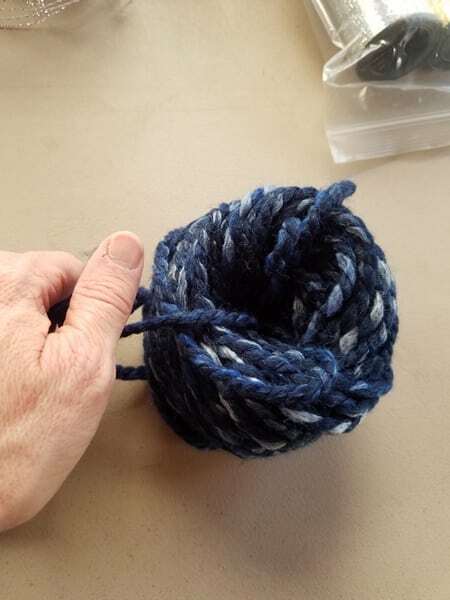 Take a piece of yarn 10-12″ long, and wrap it around the middle of your loop to help hold it together. Tie a knot to hold it. Step 4: Now, use the ends of the piece of yarn you just tied together, and split your big loop in half and create two new even loops. Step 5: Now, you can cut your loops to create the pom. 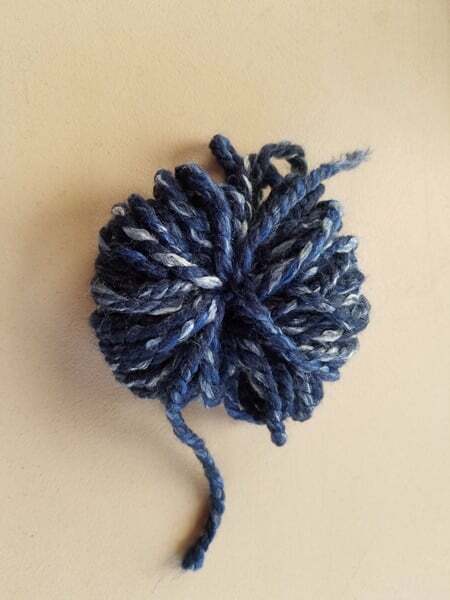 Step 6: You may need to trim any uneven lengths of yarn to create a symmetrical pom. 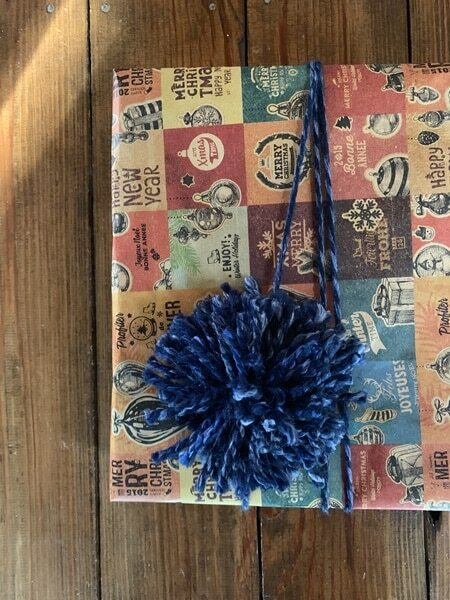 Then, wrap yarn a few times around the package and tie on the pom. I love snowmen! They are my favorite decorations at Christmas. They are always so happy! So, I couldn’t resist trying out this snowman wrapping paper. 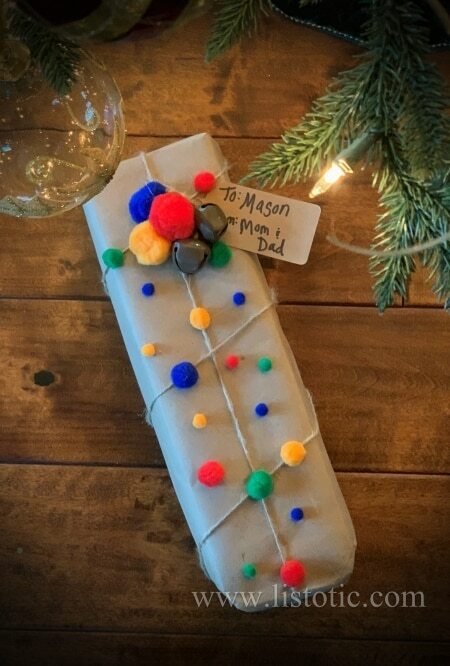 The instructions I found at Artsy Craftsy Mom called for using sponges. I didn’t have circular sponges, so I used the eraser end of a pencil. TIP: Next time, I would draw out the snowman to get the dimensions right before I started. In my case, I had to keep making the snowman bigger to get him to fill up the page and look somewhat symmetrical. 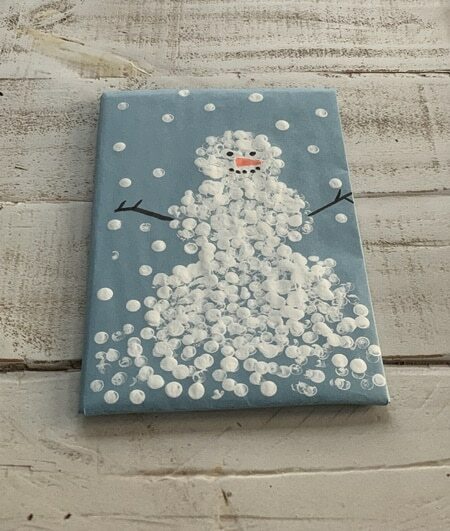 Just like the inspiration, I could have added a top hat and scarf, but I liked the simplicity of this snowman. And, notice, he is smiling!